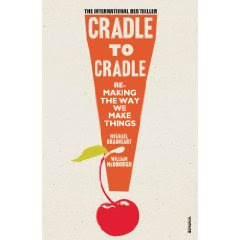 Quotes from the book 'Cradle to Cradle', which I hope will inform and inspire my design journey. "The design intention behind the current industrial infrastructure is to make an attractive product that is affordable, meets regulations, performs well, and lasts long enough to meet market expectations. Such a product fulfills the manufacturer's desires and some of the customers' expectations as well....products that are not designed particuarly for human and ecological health are unintelligent and inelegant - what we call crude products." " Certainly at one time fabrics were biodegradable and unwanted pieces could be tossed on the ground to decompose or even be safely burned as fuel. But the natural materials to meet the needs of our current population do not and cannot exist. If several billion people want natural-fibre jeans dyed with natural dyes, humanity will have to dedicate millions of acres to the cultivation of indigo and cotton plants just to satisfy the demand....even 'natural' products are not necessarily healthy for humans. Substances created by nature can be extremely toxic; they were not specifically designed by evolution for our use." "The creative use of downcycled materials for new products can be misguided, despite good intentions. e.g. people may feel they are making an ecologically sound choice by buying and wearing clothes made of fibres from recycled plastic bottles. But the fibres contain toxins such as antimony, catalytic residues, ultraviolet stabilizers, plasticizers and antioxidents, which were never designed to lie next to human skin." "To eliminate the concept of waste means to design things- products, packaging, and systems - from the very beginning on the understanding that waste does not exist." "What about fabrics that don't need soap to get clean, that are designed to enjoy a "lotus effect"? (Nothing sticks to a lotus leaf.)"